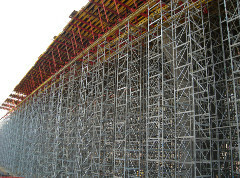 Connections Training and Staffing offers the most comprehensive OSHA compliant scaffold safety training course in Colorado. Falling from heights is the most common reason for injury and death in the construction field and having proper training on scaffold safety can drastically reduce the chances that this will happen in your companies work zones. According to the Bureau of Labor Statistics, 72% of workers injured in scaffold accidents blamed the accident either to the planking or support giving way, to the employee slipping, or to the employee being struck by a falling object. Having OSHA compliant training in scaffold safety is imperative for your employees and essentail to any accident free work zone. Connections Training and Staffing will educate your employees on fundamental scaffolding construction methods including: Inspection, fall protection, falling objects safety, moving and altering scaffolding, ensuring stable access, and more. Our experienced instructors are thorough in course material and offer the course in both English and Spanish.